Dry bakery display cases are attractive floor model cases that are designed to keep products fresh without drying them out. With curved glass covers and lighting, these display cases will invite your customers over and entice them into making their purchases. Since they are covered, they are sanitary and keep contaminants out while keeping products fresh for longer periods of time. 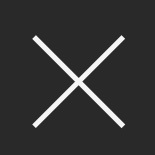 Since they have lighting, they attract users right as they enter your bakery. 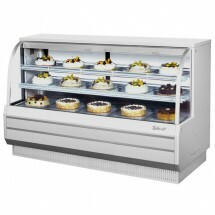 Our selection of non-refrigerated bakery cases from True and Turbo Air is an excellent investment for any bakery. Turbo Air TCGB-36DR-R-N Red Curved Glass Dry Bakery Display Case 36" Sold As: 1 ea You're pre-approved for a cash advance! 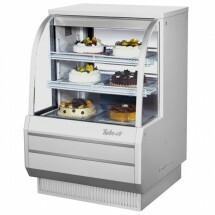 Turbo Air TCGB-36DR-W-N White Curved Glass Dry Bakery Display Case 36" Sold As: 1 ea You're pre-approved for a cash advance! 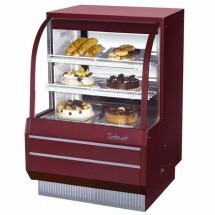 Turbo Air TCGB-48DR-R-N Red Curved Glass Dry Bakery Case 48" Sold As: 1 ea You're pre-approved for a cash advance! Turbo Air TCGB 48DR-W-N White Curved Glass Dry Bakery Display Case 36" Sold As: 1 ea You're pre-approved for a cash advance! 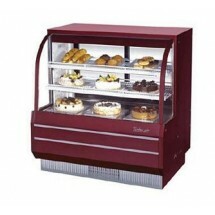 Turbo Air TCGB-60DR-R-N Red Curved Glass Dry Bakery Display Case 60" Sold As: 1 ea You're pre-approved for a cash advance! Turbo Air TCGB-60DR-W-N White Curved Glass Dry Bakery Display Case 60" Sold As: 1 ea You're pre-approved for a cash advance! 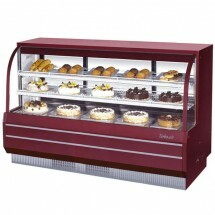 Turbo Air TCGB-72DR-R-N Red Curved Glass Dry Bakery Display Case 72" Sold As: 1 ea You're pre-approved for a cash advance! 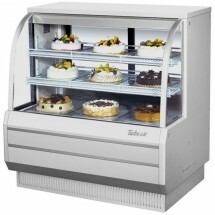 Turbo Air TCGB-72DR-W-N White Curved Glass Dry Bakery Display Case 72" Sold As: 1 ea You're pre-approved for a cash advance!